Our Hi-Performance Doors use a direct-drive system motor instead of springs to give you a faster, more reliable rolling door. 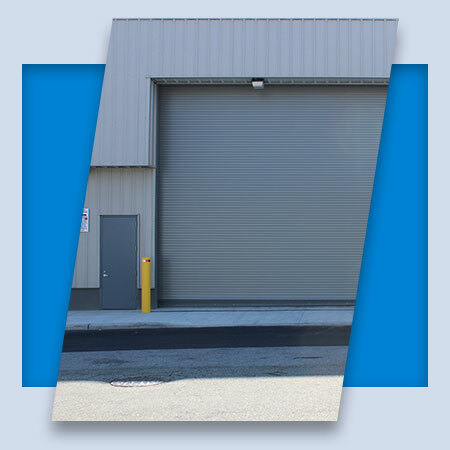 Lower your maintenance costs, maintain the temperature of your work environment, and invest in a door that operates five times longer than other rolling doors. Contact us today for more information about our Model 300-HPD and Model 400-HPD. These Hi-Performance rolling doors also have optional features that can be installed depending on your necessities and work environment. The laser light curtain will stop and reverse the rolling door when it’s closing if it detects an object passing through the door at any point. While other rolling doors only have this feature available for up to six feet high, our laser light curtain safety feature detects movement for the entire height of the door. You can also customize your rolling doors with special material and finishes. You have the option of stainless steel, anodized aluminum, powder coating, or hot-dipped galvanized steel. You can also have your Hi-Performance rolling doors made with ventilating curtains. These doors will be manufactured with perforated slats, fenestrated slats, or steel rod grilles. The Hi-Performance rolling doors have a higher life cycle and lower cost of maintenance than other steel rolling doors. The unparalleled performance comes from the use of a direct-drive operator instead of springs. This allows the door to operate for 500,000 cycles with little maintenance. It also increases the speed of the door to 48 inches per second. The variable speed operator includes a slow start and stop feature that minimizes the wear and tear to both the rolling door and the driver system. The floating-end bracket design further reduces friction. This allows the Hi-Performance rolling doors to open at a speed of up to 48 inches per second and close as quickly as 24 inches per second. The Hi-Performance rolling doors also reduce the costs of heating and cooling. By being able to open and close doors quickly, there is less air coming in from the outside and you’ll be able to maintain the temperature of the internal work environment. The use of a direct-drive system is reliable because it prevents the door from failing or falling. While spring-operated doors have a maximum of 100,000 cycles, the Hi-Performance rolling doors operate five times as long. And while spring-operated doors are prone to dis-alignment, the direct-drive system will not cause the curtain to fall out of alignment. A direct-drive motor with an integrated anti-fall device. It doesn’t have any roller chain or drive sprockets. A door barrel with a springless design that reduces maintenance requirements and allows for high-speed capability. Brackets that keep the door curtain aligned continuously with the track. The floating door barrel supports of the brackets reduce friction and enable higher door speeds of up to 48 inches per second while opening and 24 inches per second while closing. The rolling door curtain can either be insulated or non-insulated. Door material will be either aluminum, galvanized steel, or stainless steel. Steel angle guides come standard with UHWM anti-wear strips. This anti-wear capability reduces friction and curtain wear. The curtain also has weather seals: brush seals around the sides and top of the rolling door that keep out dust and debris. Mounting tubes are included with the Hi-Performance Door, making these models self-supporting. The tubes are anchored to the floor and attach to the door jambs. The mounting tubes eliminate the need for additional header support. A bottom bar that is a safety feature including two structural angles with a wireless safety edge. The edge forms a seal between the door and the floor. This bar will reverse the direction of the rolling door if it hits something. United Steel Products prides itself in providing quality rolling doors that are reliable and safe. Our Hi-Performance Doors offer innovative technology and quality parts that work to make them a lasting, dependable product. Contact us for more information about the Model 300-HPD or Model 400-HPD Hi-Performance Door. You can also check out all of our products to compare capabilities and features.